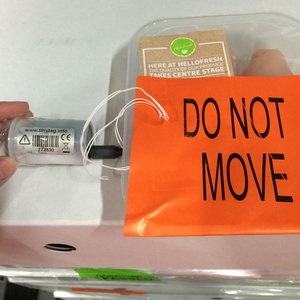 Meal boxes are shipped using temperature controlled packaging which is evaluated by Tinytag data loggers for effectiveness, in order to ensure product quality and safety. HelloFresh UK is an innovative meal home delivery company who supply tasty recipes and ingredients. It is essential that the fresh produce is kept during the correct environmental conditions in a chilled recipe box during delivery to ensure the safety and freshness of the product for the customer. Vanda Pitono, Food Technologist at HelloFresh UK uses Tinytag data loggers in trials to record the temperature over time. Tinytag Transit 2 data loggers are used to monitor the air temperature inside the cool bags, while Talk 2 loggers monitor the temperature of chilled products. Analysing the results allows conditions to be analysed according to the specifications, and comparison of the capabilities of different cool box liners. Vanda comments, "I choose Tinytags as they are flexible and easy to use, with clear presentation of results."